When studying openings I look attentively to what (strong) grandmasters play, which I already mentioned earlier in my article to analyze with a computer. However my choice of openings still remains something very personal. Besides this choice is already more or less for 20 years fixed (see the article the sequence). Even a line is only replaced when really no repairing is anymore possible (examples on my blog are Dutch steps in the English opening , the fake truth ). This all fits in the philosophy of the scientific approach but most players play the game a lot more competitive. Swapping between openings is done regularly just to become not too predictable. This means a continuous search for new playable openings. An amateur has mostly neither the time, nor the courage to do all the necessary research so we look to what grandmasters have in their repertoire. Naturally the stronger the grandmaster, the more players are attracted to this repertoire. If an absolute topgrandmaster starts to play an opening which is on top also easily playable for other players (amateur or prof) then we sometimes see a chain-reaction. A few players pick it up and their opponents are so impressed that they too insert the opening in their repertoire. If after some time it also turns out that black can show a plus-score on master-level than it completely goes wild. Some smart readers in the meantime will realize that I want to discuss this time the Aronian system or also called sometimes the Cozio defense deferred. 5 years ago this variant was still considered as eccentric but today a lot of (strong) players are playing it. The system has some unique characteristics. First it gives a direct answer on the Spanish, which today is still considered as the main-weapon for white after e5. So it is in the same category of openings like the Schliemann-gambit or the Berlin. On top we can play the opening via a number of sequences. When Aronian started to play the system in 2009, he chose for the sequence 1.e4 e5 2.Pf3 Pc6 3.Lb5 Pge7 4.0-0 a6 5.La4 g6 6.c3 Lg7. However soon it was discovered that it is also possible to play first a6 or even g6. These permutations mean permitting or excluding certain side-lines. I don't know the sensitivities but I do know that since 2011, Aronian changed to the sequence 1.e4 e5 2.Pf3 Pc6 3.Lb5 a6 4.La4 Pge7 etc. This means the exchange variant of the Spanish is again permitted but probably some nasty lines (quick d4?) are avoided. The impact of this change can be clearly seen if we put in a time-line the popularity (number of games per year with a player of +2300 in my database) with this specific sequence. Also end of last year in the European championship for countries (in which Bart achieved the grandmaster title) we noticed several games with this opening. First I want to show a marvelous game played by Aronian whom refutes harshly the white experiment. Readers following my blog already for some time, will certainly understand that I am not surprised that our Belgium topplayer Tanguy Ringoir also has picked up this opening in his repertoire. Also he became a real fan of it which obviously is strengthened if you win games as shown below. Now he is not the only Belgian player following this trend. I noticed in the previous interclub-round that the opening was successfully employed by GM Luc Winants. 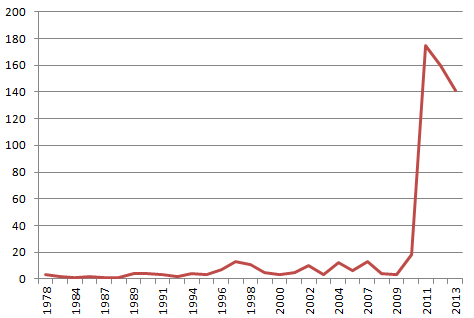 Other well-known Belgian players (or broader taken very active in Belgium) are e.g. FM Hans Renette, IM Koen Leenhouts, FM Michel De Wit and Roel Goossens. About this last player I want to elaborate as he played a very good tournament in the passed Open Leuven as he missed the tournament-victory only narrowly (see the final positions). I was very impressed by his play in our mutual game and I do know that I was lucky to obtain a draw. I don't need to tell you probably that we discussed the Aronian-system, right? The examples are showing one by one that blacks opening has a lot of potential. 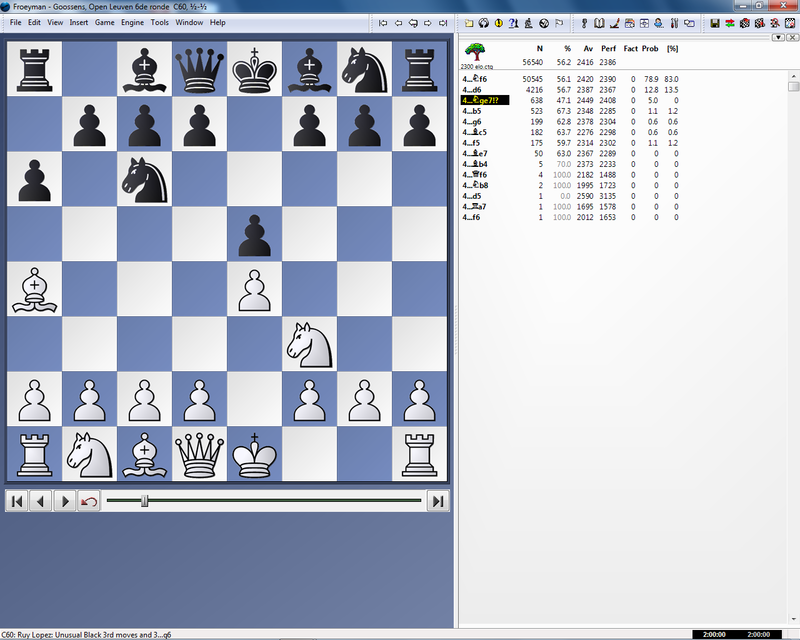 The scores for black are exceptionally good which we notice from the screenshot of my opening-book. However I have to add in fairness that black also had in most cases the higher rating. White scores only 47,1% after Nge7 ! 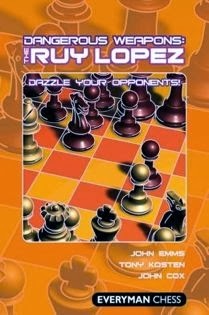 The system is still popularized a lot as for example in the recent book Dangerous Waepons: The Ruy Lopez written by the English GMs John Emms, Anthony Kosten and the English IM John Cox there are at least 30 pages spent to it. However it still is blurry what the future will bring for this opening. Is it just fashion or will it become more? In any case I don't expect the opening getting the same magnitude as the Berlin. If the opening will get a fixed place in a grandmaster-repertoire will depend a lot if refutations will be found or less strongly stated some annoying lines. In my analyse of the game against Roel, I show a possible path in which some advantage can be found. I admit it is still very complex but I do have reasons to be optimistic as afterwards I noticed that Tony Kosten also recommends the concept in his book. No, I didn't buy (yet) the book but by coincidence when preparing this article I found a review on Chesscafe which indeed exactly discusses this idea. Probably I again invented the wheel which is unfortunately the destiny of a player not buying books (if we disregard some exceptional books) and mainly bases himself on his own analysis. Vass managed to ditch up a "model"game in his databases, see chesspub which represents the idea recommended in the article.